Focus on cost control: 45% of WOBs focused on controlling costs in response to economic challenges, while 31% concentrated on increasing sales. 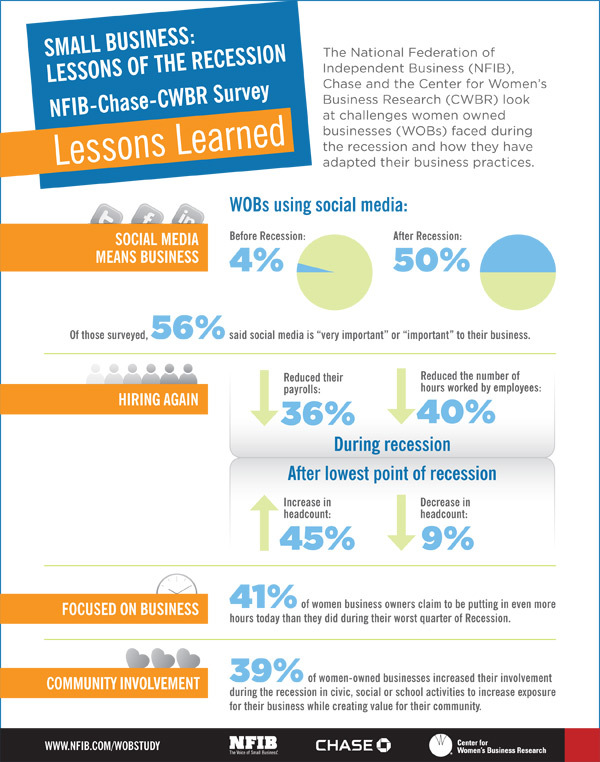 Use social media as a business tool: Half of WOBs owners now use social media compared to 4% before the recession. Of those surveyed, 56% said social media is “very important” or “important” to their business. Promote the business through community activities: 39% of WOBs increased their involvement in civic, social or school activities to boost their exposure and create value for their communities. The Small Business: Lessons of the Recession study was a telephone and online survey conducted between March 28 and April 11, 2012. The survey polled a total of 760 business owners, 559 women and 201 men. An expert panel discusses highlights of a study on how women-owned businesses performed during the recession. Only 4% of women-owned businesses used social media to help their business before the recession, but nearly half do today. Many cut costs by placing more emphasis on customer service, leveraging community involvement for PR, narrowing sales focus to existing customers, and using an outside consultant. Many of today’s women-owned businesses (WOB) are led by recession-tested entrepreneurs whose experiences provide valuable insight into the challenges that may await aspiring small-business owners. A new study released by Chase Card Services, a division of JPMorgan Chase & Co., NFIB and the Center for Women’s Business Research, looks at how women small business owners performed during the “Great Recession.” The research suggests small businesses should focus on metrics: understand your business, how to measure finances, and keep current.